This last Wednesday my kiddos started school and it was the first sign that Summer soon will be coming to an end. and today I am happy to be sharing it with you here. This is the sweetest wreath you have ever seen. My kids love it, your kids will love it and your neighbors kids are going to want to move to your backyard. I know it looks fun BUT there is a lot more to this wreath than what your eyes can see. Inside of each balloon there is a prize. You are not looking at just a wreath… This is a game. Let me share the tutorial with you first. 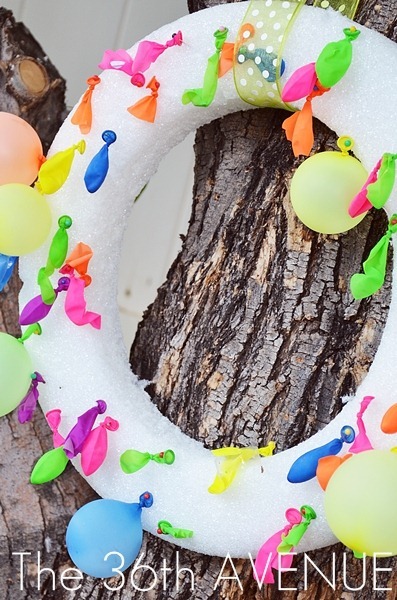 The main thing you are going to need for this project are a foam wreath and water balloons. 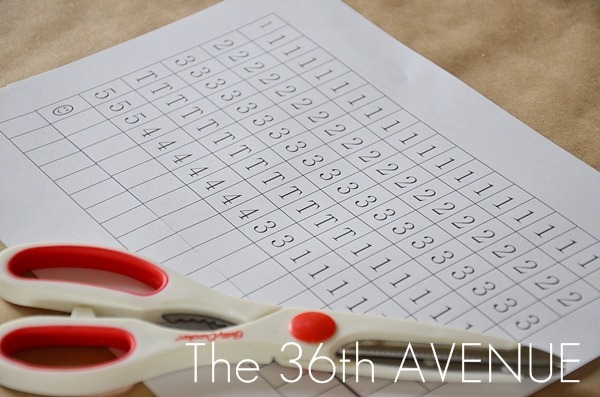 The first thing I did was type and print a piece of paper with a bunch of numbers from 1 to 5. There are a few T’s and one happy face. 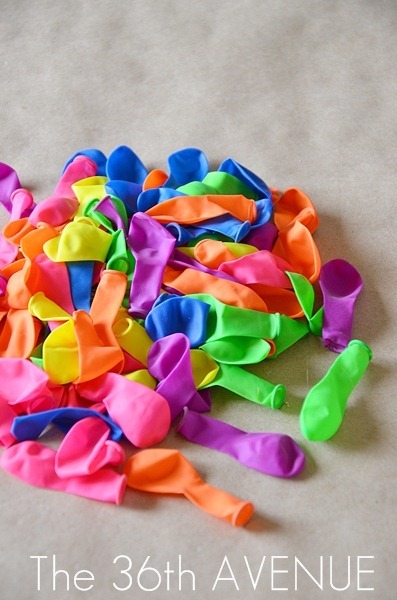 You want to cut out all of these little pieces of paper and put them individually inside of each balloon before you blow them up. Don’t make them too big. I purchased our balloons at The Dollar Store since they are thinner than the regular water balloons you find in other stores. 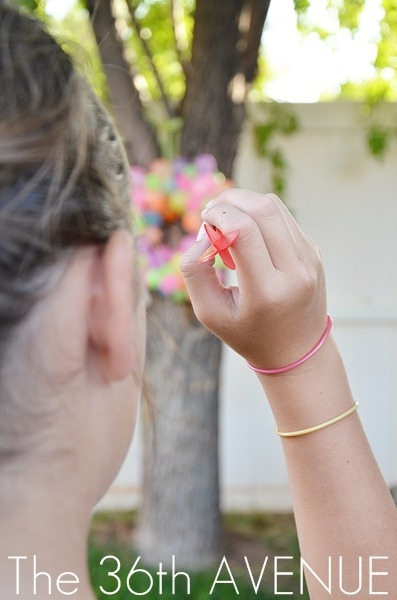 The thinner they are, easier to blow and easier to pop… that is what you want. As you blow them up, pin them to the wreath. this wreath will look super fun! 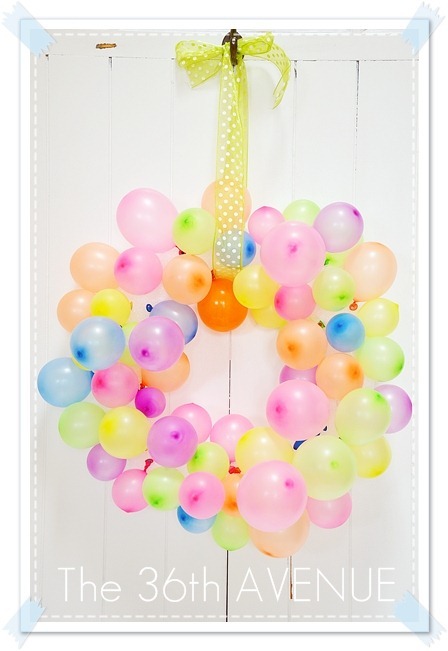 When you are done and your wreath is covered with balloons it is time to play. 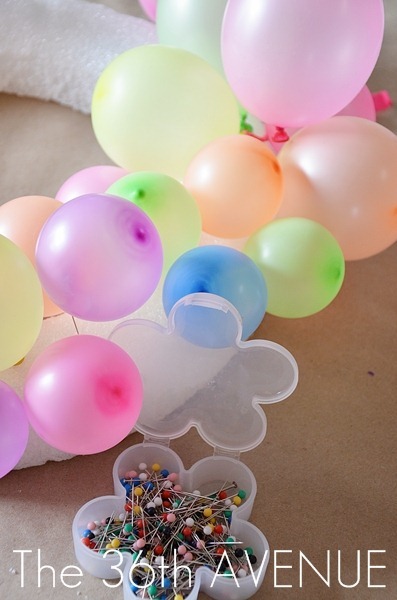 The objective of the game is to pop the balloons. 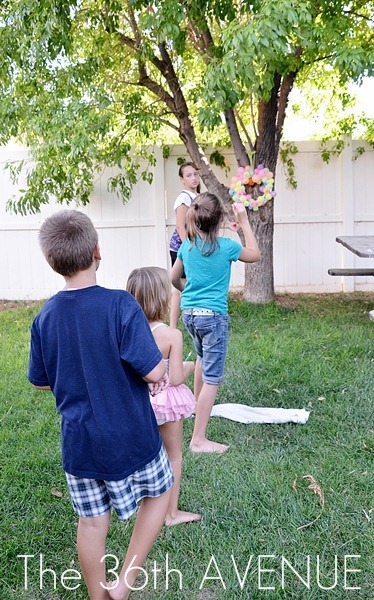 Go to your backyard and hang the bubble wreath from a tree. Each players will take turns to throw a dart to the wreath. 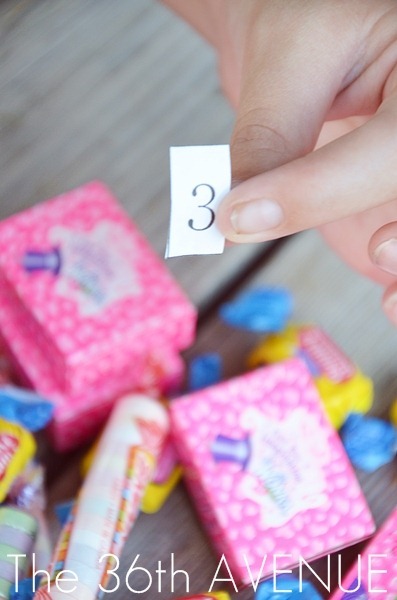 They will get as much candy as the number they pull from the balloon they popped. If the player gets a T then he will get another turn. 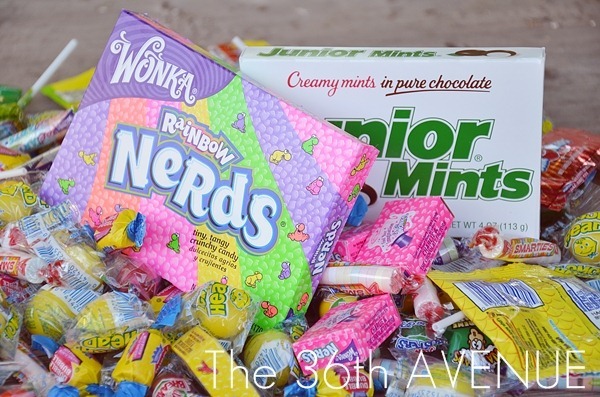 Whoever gets the happy face will get the big box of candy! It is fun and sweet plus it’s the last real sugar high that my kiddos get before school. 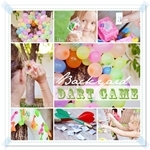 I hope you give it a try and end the Summer with a simple fun celebration that your little ones will love. 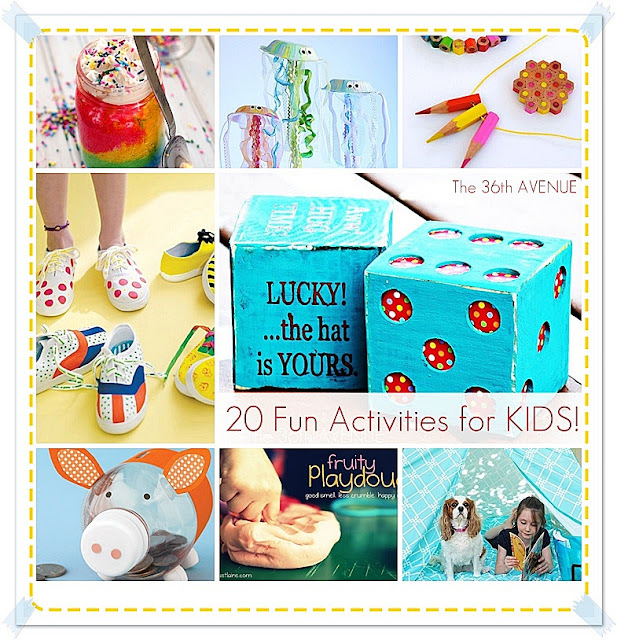 Here are a few more fun ideas, activities and kids crafts for the weekend! Turn your backyard into a gigantic game board here. 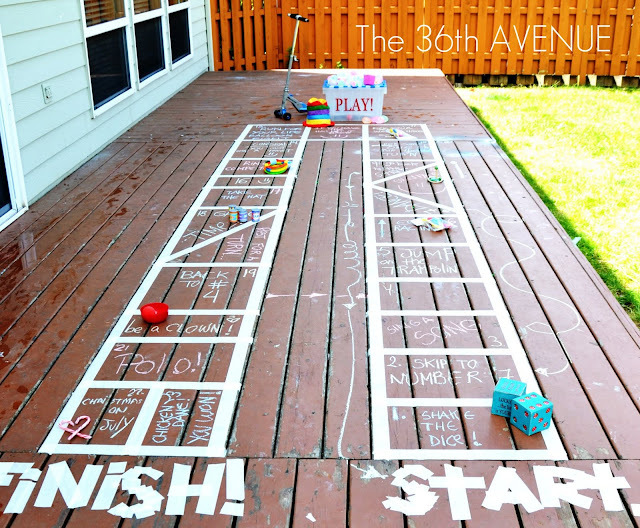 Or discover a bunch of fun activities for kids on my favorite 20 projects for them here. This is such a cute idea! I was wondering bout how many balloons did you end up using? Thanks! This is such a fun idea. I tried it with my kids yesterday and we had a blast! Thanks for sharing it. Awesome! My kids love it as well… It makes me happy that you gave it a try! This is great! 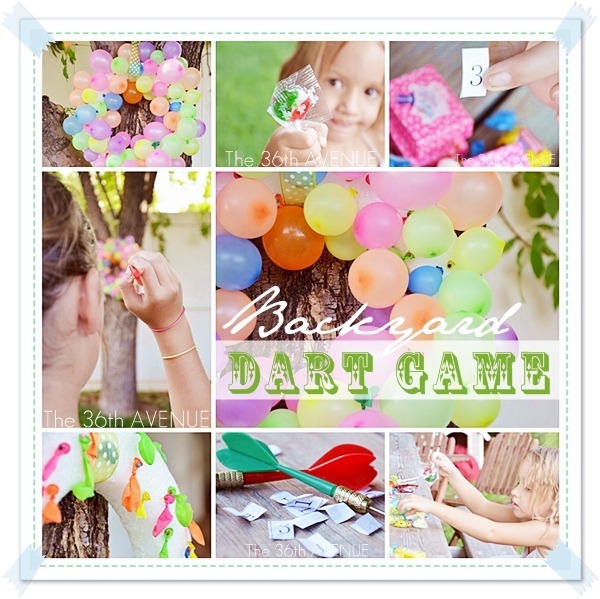 I think this could be a fun party game, but does anyone have an idea about how this might could be done inside (so you don’t have to worry about having holes in the wall from the darts)?